Just because you are on-the-go, doesn’t mean you have to buy pre-packaged snacks. Packaged snacks are more expensive, and often contain refined flour, lots of sugar, colors and preservatives. 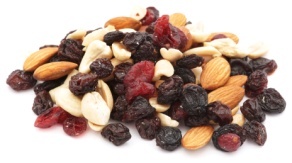 Here are some easy and healthy snacks that you can pack in your Wean Green cubes and throw in your purse or diaper bag: raisins, dried apricots, freeze dried fruits or veggies, nuts, trail mix, cheese cubes, cereal, granola, chopped fruit, frozen veggies, berries, boiled eggs, and mini pitas. 1) Nuts (peanuts, walnuts, almonds – as long as your child is over 4 to avoid choking hazards. Or chop up finely). 2) Seeds (pumpkin seeds, sunflower seeds). 3) Dried fruit (chopped apricots, dates, prunes, cranberries, cherries). No need to add sugar or oils, or to bake. Just mix together! Wean Green Travel Tip: Add a couple M&M’s or chocolate chips to the trail mix to keep your kids occupied while they search for treats! This entry was written by Melissa, posted on June 11, 2014 at 11:00 am, filed under Feeding Weaners & Families, Wean Team. Bookmark the permalink. Follow any comments here with the RSS feed for this post. Both comments and trackbacks are currently closed.